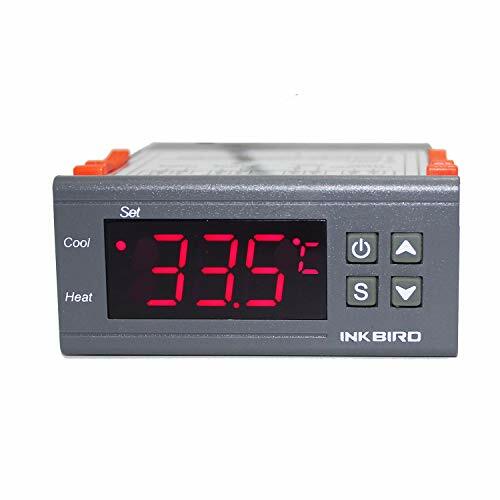 Inkbird All-Purpose Digital Temperature Controller Fahrenheit & Centigrade Thermostat w Sensor Cooling/Heating Specification: Output: 2 Relays Temperature Measuring Range: -50~210 F / -50~99 C Resolution: 0.1 F / 0.1 C Accuracy: 1 F (-50~160 F) / 1 C (-50~70 C) Power Supply: 110VAC 50Hz/60Hz Power Consumption: 3W Sensor: NTC Sensor Relay Contact Capacity: Cooling (10A/250VAC)/ Heating (10A/250VAC) Ambient Temperature: 0~60 C Storage Temperature: -30~75 C Relative Humidity: 20~85% (No Condensate) Front Panel Size: 75(L)*34.5(W)mm Mounting Size: 71(L)*29(W)mm Product Size: 75(L)*34.5(W)*85(D)mm Sensor Length: 2m (include the probe) Package Included: 1x ITC-1000 Temperature Controller 110v with 6.67 NTC Sensor FAQ: Q1: How to wire? I can hear the relay inside the unit click, but I can't get any voltage on the cool or heat terminals. A1: IMPORTENCE: Please don't forget to wire the Heating and Cooling device to Power supplier and make a circuit. Q2: The cooling device doesn't work, even though the temperature reaches TS+DS, and the Cool indicator lamp is flashing. A2: The cooling has delay function. If you want to run immediately and don't need the PT function, you can set PT=0. [Two Modes] Have two relays. Switch between cooling and heating modes. Support F/ C display. [Setting Value] Control the temperature by setting the temperature set value and the difference value. 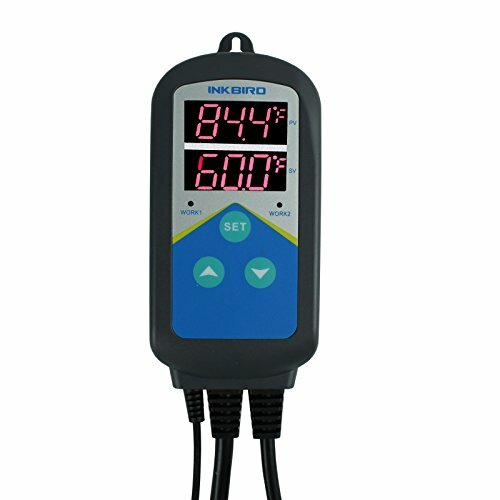 [Different Functions] Refrigerating control output delay protection, and temperature calibrating. [Alarm for Safe] Alarm when temperature exceeds the limit or when sensor error. [Long Warranty] Have warranty for one year. Brand: Inkbird | Manufacturer: Inkbird Tech. 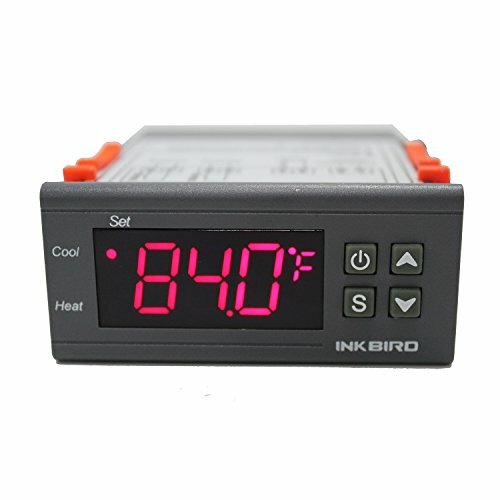 IHC-200 is an easy-to-use, safe and reliable dual relay output humidity controller. Its play-n-plug designed, dual LED screens enabling more humanized. IHC-200 can control any 100-265 volt humidifier, dehumidifier or fan. Please unplug devices from the controller when not in use. When the power comes back on after a power failure the unit will act as if it has been turned on again and will power the ouputs. To disable power, unplug the device. Do not rely solely on the power button. 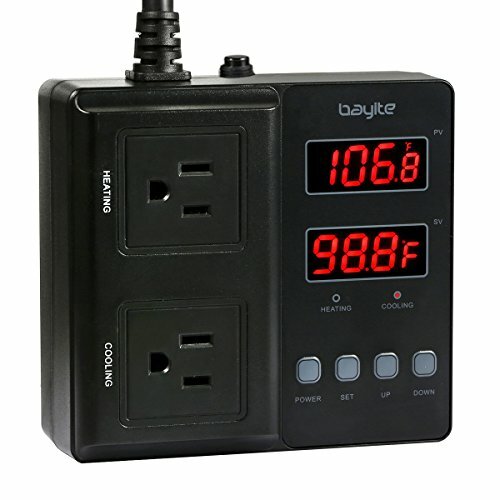 The BTC201 temperature controller can turn on/off an electric appliances at desired temp. For example, you can use the controller to turn on/off a heater and a fridge to keep temp around 100 F. Turn on heater at 98.5 F. Turn on fridge at 105 F. Turn off the heater/fridge when temp reaches 100 F. The setting is (SV=100, Cd=5, Hd=1.5). the controller itself doesn't change temp. Compressor delay protection time setting. 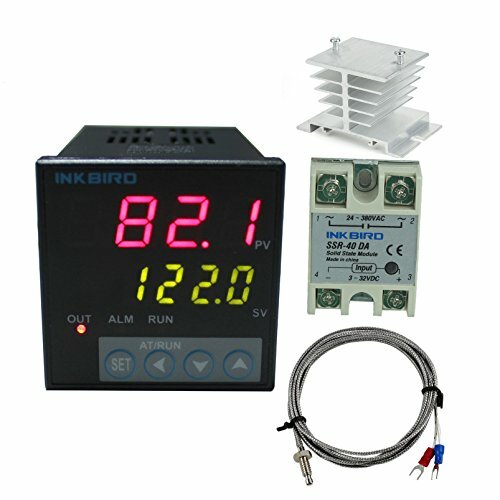 Inkbird day and night temperature controller is a pre-wired heating output temperature controller (No Cooling Control) with time function specifically for breeding and planting. It can be set to two different temperatures with its function of dual time cycle setting during 24 hours according to the day and night, which can more suitable for the physiological needs of animals and plants. It can be widely use in over-heat protection and automatic temperature control system of all sorts of electrical equipment for aquarium, pets breeding, hatching, fungus fermenting, and seed germination accelerating, etc. With large power output 1,200W, it's suitable for most applications. And the temperature can be controlled more accurately with its function of temperature calibration and temperature hysteresis. [Convenient Design] Plug and play, easy to use. Support reading with Centigrade or Fahrenheit. 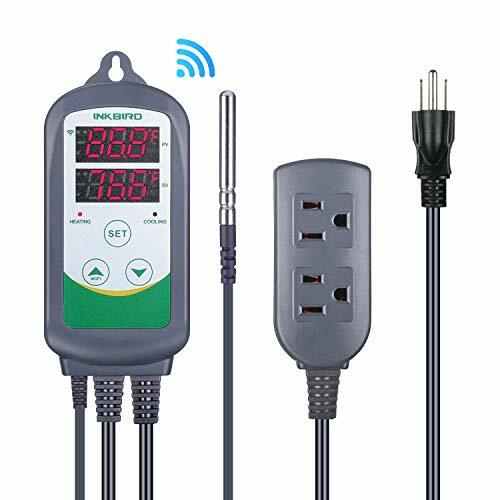 [Dual Display Window] Be able to display measured temperature and set temperature at the same time. [Dual Time Cycle Setting] Can be set different temperature from day and night on the basis of the physical needs of animals and plants during 24 hours. [Only Heating] Temperature Control Mode: On/Off Control. Please note it is only heating controller without cooling function. Both of the plugs can control the heating. But totally could not over 1200W. [Different Functions] Temperature calibration, over-temperature and sensor fault alarm. Maximum output load: 1200W (110V). 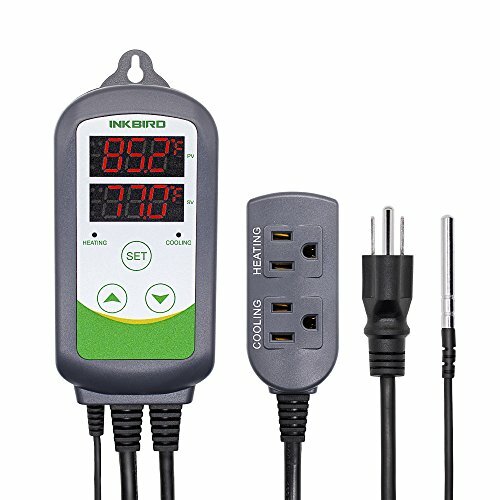 The BTC211 (BTC200 Series) temperature controller can turn on/off an electric appliances at desired temperature. And the operation has been simplified for ease of use. For example, you can use the controller to turn on/off a heater and a fridge to keep temp around 100 F. Turn on heater at 98.5 F. Turn on fridge at 105 F. Turn off the heater/fridge when temp reaches 100 F. The setting is (SV=100, Cd=5, Hd=1.5). Please note that the controller itself doesn't change temp. Plug and play. No worry about wiring. Nichrome 80 Wire has a low temperature coefficient of resistance and a low change in resistance during its service life that combine to assure faster heat-up times, more uniform operating temperatures, and a longer useful life. Its excellent mechanical stability minimizes variables in element design, assures even stretch in coiled form, and eliminates problems of shrinkage, growth, sag, or distortion in use. This wire is for repair and maintenance of electronic components. 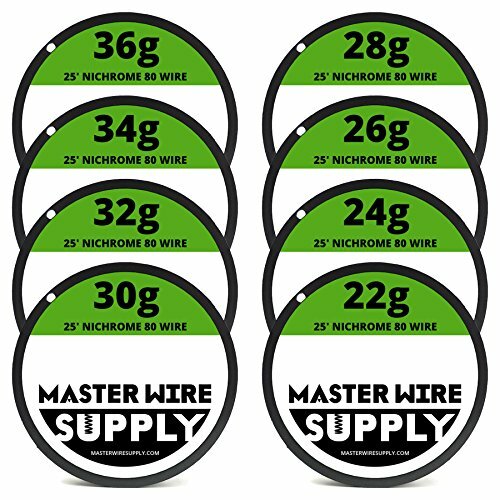 Typical applications for Master Wire Supply Nichrome 80 wire are: Industrial and hobby hot-wire foam cutters, internal support in ceramics, home and industrial heaters, diffusion heaters, dishwashers, cooking plates, electric blankets, hair dryers, kerosene-fired appliances, kettles, refrigerators, rice cookers, tumble dryers, washing machines, electrical heating elements in high-temperature furnaces for heat treatment, glass, steel, and electronics industries. WIFI smart controller supports both IOS & Android WIFI supports 2.4GHz Wi-Fi router, free APP "InkbirdSmart" which is able to monitor temperature at any time. [WIFI & APP] WIFI smart controller supports both IOS & Android WIFI supports 2.4GHz Wi-Fi router, free APP "InkbirdSmart" which is able to control temperature at any time. Support Amazon Alexa, Google Assistant and IFTTT. 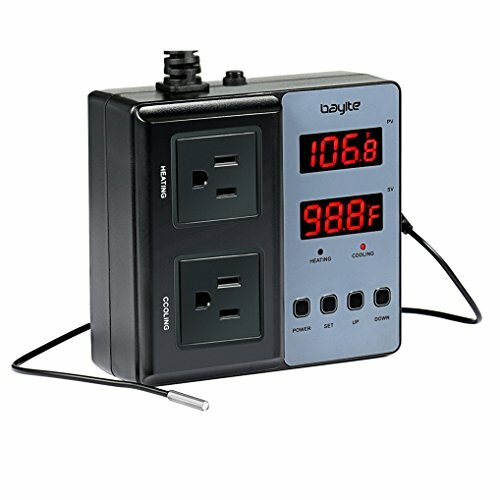 [Convenient Design] Plug-n-play, easy to use. Support / reading and Temperature calibration. [Convenient Design] Plug and play, easy to use. Support reading with Centigrade or Fahrenheit. [Only Heating] Temperature Control Mode: On/Off Control. Please note it is only heating controller without cooling function. Both of the plugs can control the heating. But totally could not over 1200W. [Dual Time Cycle Setting] Can be set different temperature from day and night on the basis of the physical needs of animals and plants during 24 hours. [Different Functions] Temperature calibration, over-temperature and sensor fault alarm. Maximum output load: 1200W (110V). [Convenient Design] Plug and play, easy to use. Support C/ F display. [Dual Relay Output] Be able to connect with refrigeration and heating equipment at the same time. [Dual Display Window] Be able to display measured temperature and set temperature at the same time. [Buzzer Alarm] High and low temperature alarms are available when the temperature is over or the sensor is with issue. [Warranty & Safe] Warranty: 1 year. Maximum output load: 1100W(110V). It is with temperature calibration and compressor delay which can protect your refrigeration. 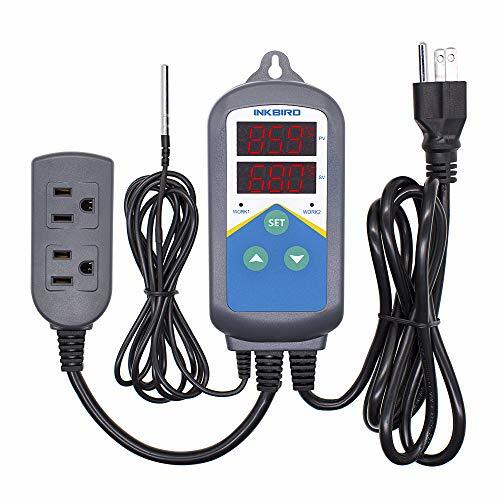 This is an AC 110V Fahrenheit Digital temperature controller. It can control the power to a freezer to prevent it from getting too cold, or control the power to a terrarium to prevent it from getting too hot, maintain a stable environment. 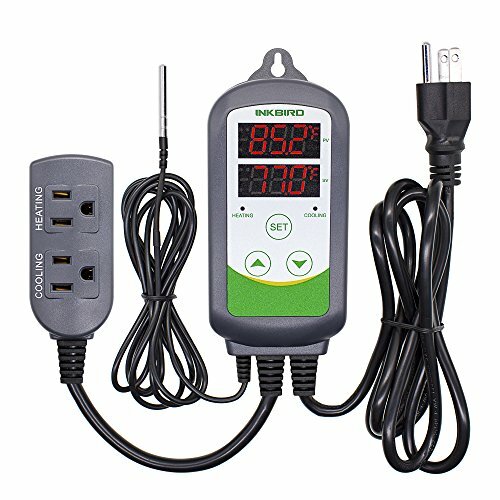 This controller provides heating and cooling modes and temperature alarm function. KEEP TEMPERATURE IN DESIRED RANGE: It's on/off control mode. Turn on your device at a degree and turn it off at another degree. The difference of the 2 degrees can be minimum 1 and maximum 25. HEATING OR REFRIGERATION WORKING MODE: Switch between heating mode and refrigeration mode according to the device your need. WIDE RANGE OF USES: seedling heat mat, home brewing, aquarium, pet breeding, incubation, BBQ, fermentation, accelerating germination, electric radiator, electric oven, etc. 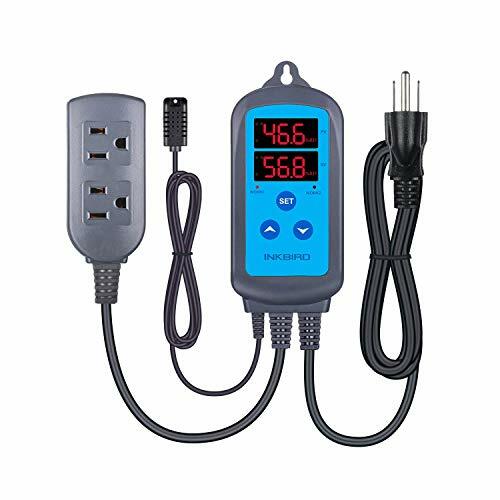 PN160 is an easy-to-use, safe and reliable dual relay output temperature controller. 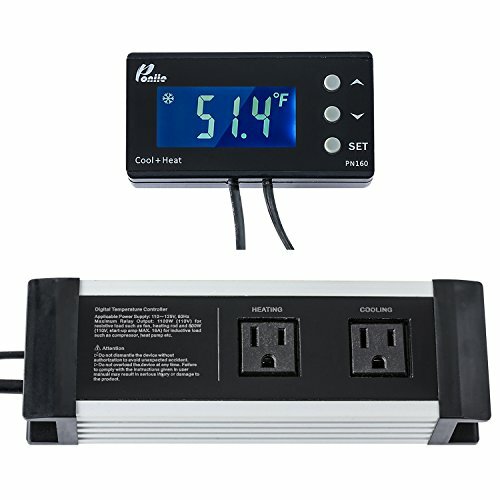 This product is able to connect with refrigeration and heating loads at the same time to realize ideal temperature control. The multifunctional thermostat can be used in many areas in our daily life. It is perfect to be used as over temperature protection or automatic temperature control system for various tasks. Such as Sous-vide, Home-brew & Fermentation, Kegerator, Aquarium heat control, Breeding & Incubation, Germination & Seedling heat mat etc. This listing sensor's probe dimension is 50mm x 6mm. If you want 12" probe sensor, you can search on Amazon and buy one by ASIN: B01A6DIPFM or ASIN: B01A51OLR6. [Convenient Design] Plug and play, easy to use. [Reading Mode] Support reading with Centigrade or Fahrenheit unit. [Safe] Maximum output load: 1100W(110V). 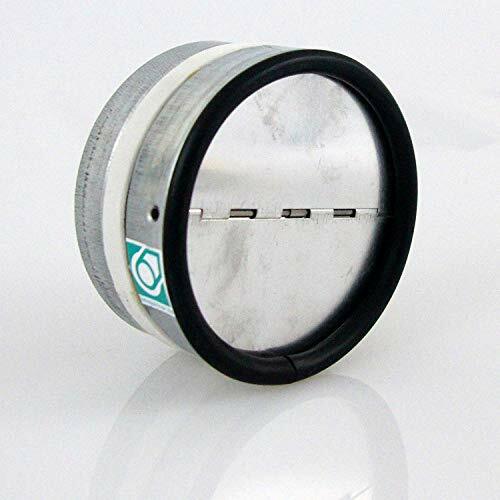 FUNCTIONALITY: Backflow dampers prevent cold air or wind from entering the ventilation pipe. In this case, the flap is installed in such a way that the flap leaves only open into the outgoing air direction. This means that no (cold) air / wind can penetrate the ventilation pipe from the outside. INSTALLATION: The backflow valve is installed by pushing it into the ventilation pipe as far as it will go. The position of the spring should be horizontal when the flap is installed horizontally so that it can be opened and closed optimally. This also applies to the vertical installation. 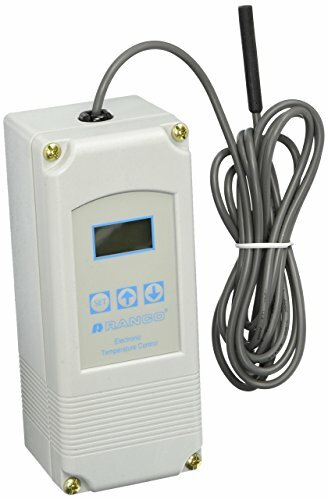 RANCO ETC-111000 Digital Cold Temperature Control NEW. Dimensions: 6.52 inch high x 2.7 inch wide x 2.48 inch. SPDT output relay. 12/240 Input Voltage. NOTE: The manual is the same with 110V manual. 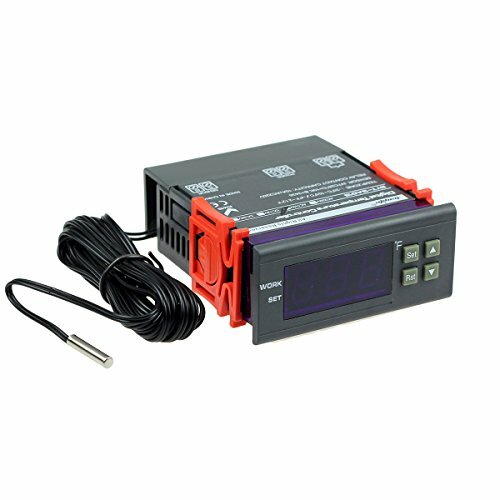 If the description on the unit is 12V, pls connect 12V device. 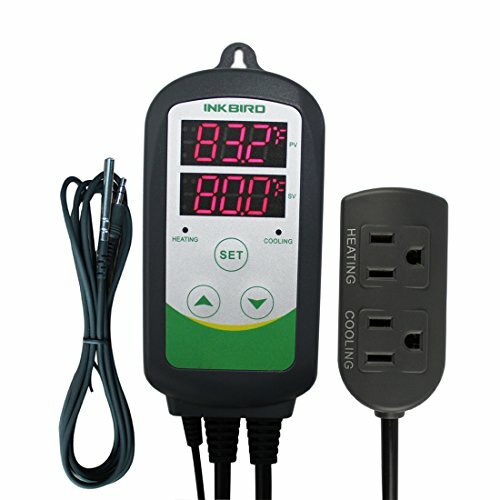 Don't connect 110V Device. Thanks for your understanding. - Plug and play design, easy to use. - Support reading with Centigrade or Fahrenheit unit. - Compressor delay protection for refrigeration control. - High and low temperature alarms are available. - Over-temperature and sensor fault alarm. - Heating/Cooling differential function could be set separately for cooling and heating to protect temperature controller from violent change. [Convenient Design] Support F/ C display. Easy to set, PV and SV dual display windows. [Dual Relay Output] You can use the cooling device or heating device separately, or you can plug the cooler and the heater at the same time. [Dual Display Window] Be able to display measured temperature and set temperature at the same time. 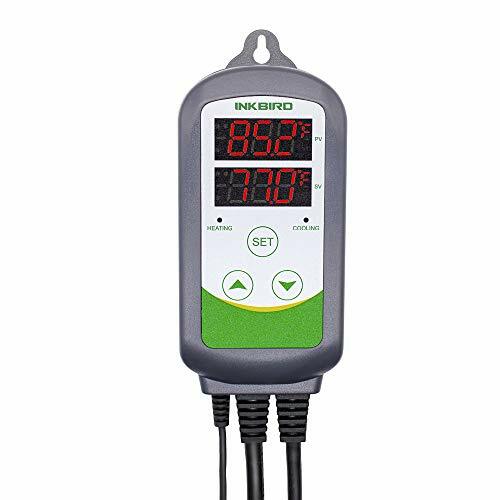 [Waterproof Sensor] The temperature controller sensor is stainless and waterproof IP68. [Alarm for Safe] Alarm when over-temperature and sensor error. Maximum output load: 1200W(110V).